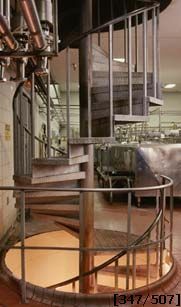 This is a multiple level staircase that is 72" in diameter and is located in an industry plant. The handrail is # 200 (1 1/2" round) steel tubing with balusters, two per tread, made of # 302 (1"square tubing). The treads are a # 100 (12 gauge) 30 degree checker plate surface with optional closed risers between each tread. The center column is a 6" ID schedule 40 pipe. This stair has a circular opening that requires a circular landing at each level, and it also has a well rail around one quarter of the opening. The finish has a hot dipped galvanize coating.